I meant to get this entry out a lot sooner, but I experienced something tragic in my life recently, and so blogging has been the last thing on my mind for the past month or so. That being said, thank you to all those who kept in touch with me over Twitter while everything was going down, and thanks also to the readers who remain loyal to the blog even in my extended, unexpected silence. 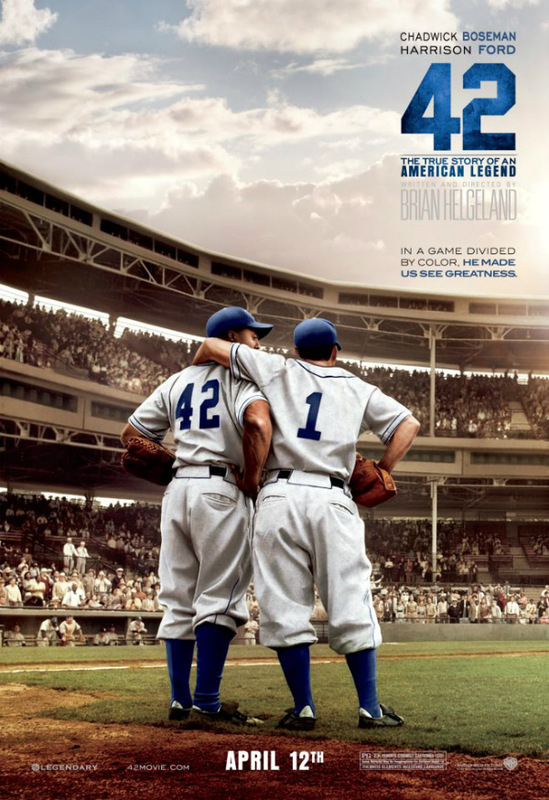 That aside, I wanted to get back into the swing of things by starting with a movie I watched recently, 42, which touches on parts of Jackie Robinson’s baseball career. I admit to having been a little skeptical about this movie being any good, since I personally found the trailers to be so vague. Also, I hadn’t seen a sports movie I liked since The Blindside (2009), not to mention the last baseball movie that really stuck out in my mind was The Rookie (2002). 42 was a little slow at first, but I actually ended up enjoying the film. The movie poster I chose for this entry is probably one of my most favorite scenes from this movie. There were a lot of heartwarming scenes, really, but this had to be one of my favorites. Again, I think even to appreciate that line, one may have to watch the movie to get the full effect of the joke. In addition to Ford’s witty lines, there’s also an awkward, yet hilarious locker room scene towards the end that I found to be quite memorable. In regards to the other actors, I think overall, the entire cast did a wonderful job. There were several though that I found worth noting. I’ll start with Christopher Meloni. I had no idea he was in this movie—then again, I didn’t really research the casting in this one before I walked in, so I can actually say that that’s true for the entire cast. I know he’s in the TV show True Blood, but I don’t really follow it. I also don’t actively follow him, but I do recognize him from Law & Order: SVU, a show I watch only on occasion and usually when there is nothing else on TV that I find worth watching. Regardless, it was interesting to see him here, and it was kind of funny to see a more sarcastic side to his acting. Alan Tudyk is also another actor that stood out to me in this movie because of his acting, but not for the typical reasons. I’ll explain what I mean. I’ve only seen Tudyk in two other roles, his supporting role in A Knight’s Tale (2001) with the late Heath Ledger and his slightly more prominent role as the villain Alpha in the TV series Dollhouse. Now since I haven’t seen him (or maybe I have and I just don’t remember) in any other movie I’ve seen, so I can’t say with full confidence that this is his trend, but I feel like this actor either goes after or is constantly being typecast into these roles where the character is just a little bit crazy. On the positive, I can say he’s very good at it. On the negative, I feel like he’s pretty much playing the same character in different movies at varying levels of psychotic. Feel free to disagree and/or point out a film where he isn’t in that type of role and I’ll be more than happy to look into it, if only to satisfy my own curiosity regarding this actor. I’m on the fence about Chadwick Boseman in this film. On the one hand, I think he plays his role well. In the scenes where it required of him to express extreme control or reveal extreme emotion, I think he did a great job. It’s also nice to see a new face for a change. On the other hand, I think I could have seen other actors in this role, like Denzel Washington for example, though I think it wouldn’t be as believable for him to be in this role now mostly due to age. Had this movie been in production during his younger years though, I think it might have been interesting to see what he could have done with the role, had he been cast. Anyway, I’m not putting down Boseman’s acting so much as I think the way the character appeared to be written seemed versatile enough to fit just about anyone willing and up to the challenge. Finally, I’d like to comment on Lucas Black, who plays Pee Wee Reese in this movie. He is the one to the right of Boseman in the movie poster I’ve included in this post. The only other role I’ve seen him in was as the teenage driver Sean Boswell in The Fast and the Furious Tokyo Drift (2006), and I don’t remember him being all too memorable then, but I did feel like based on this movie his acting has made an improvement and I thought he was one of the few actors that really stood out here. Unlike the others, I think his character’s progression was more subtle. I found myself appreciating his character more and more as time went on. By the end of the film, he was definitely one of my favorites, perhaps just under Ford. Overall I thought this was a pretty solid cast. Some stuck out more than others, but I don’t think there was a lot of unnecessary excess, if that makes any sense. Now as for what I thought about the story, as I’ve said before, I enjoyed it more than I thought I would. I’m not completely knowledgeable about the historical facts of the time period, so I have no doubt the film is riddled with historical inaccuracies and overdone scenes. The racial tension though seemed believable enough here, and I liked how it was more of a matter-of-fact approach compared to other movies I’ve seen that touch on or are built completely around the subject. At the end of the main movie, there’s a short reel that tells briefly of what happened to each of a select handful of characters portrayed in the film. A couple of the stories elicited a few chuckles from myself and a few other individuals in the theater I was in, mostly due to the irony of how certain players’ careers turned out. I think it’s a shame baseball is not as big a sport as football or basketball is in this country. Maybe this movie will bring back a new surge of appreciation for sport. One can only hope. It certainly had me wanting to rewatch Field of Dreams (1989) though, which is probably one of my most favorite sports movies of all time. At some point I plan on posting up my thoughts on Tom Cruise’s Oblivion, but not sure when I’ll get around to that. I also plan on watching Iron Man 3 at some point, hopefully this weekend, and I plan to post a review up about that at some point as well. It’s by-the-numbers and obvious, but at least it’s Jackie’s story told the way he would want it to. Can’t ever go wrong with that. Good review Rae. Nice review Rae, glad to see you back to blogging and sorry to hear about your loss.